Incredible 200-year-old plans by Marc Brunel and his son Isambard Kingdom Brunel for the world's first underwater tunnel that stretches 1,300ft beneath the Thames sell for £200,000. Plans for Thames Tunnel built between Rotherhithe and Wapping in East London. The design was deemed such a feat it was described as 'eighth wonder of the world'. Drawings were tucked in an album in Brunel family archive for more than 150 years. Sold to Brunel Museum, in east London, thanks to Lottery Heritage Fund grant. Plans for the world's first underwater tunnel designed by legendary engineer Isambard Kingdom Brunel and his father have sold for £200,000 at auction. 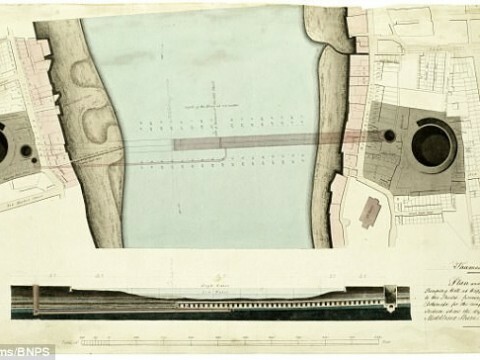 The plans, created 200 years ago, show the design of the Thames Tunnel which stretched 1,300ft under east London, between Rotherhithe and Wapping. Work on the tunnel, designed by Brunel's French engineer father, Marc, began in 1825 and took 18 years to complete. It was deemed such an amazing engineering feat it was described as 'the eighth wonder of the world'. The plans were sold as part of an incredible archive, that revealed drawing by Brunel senior from 1818 laying out his plans for the tunnel. They also included a sketch by his son, who could go on to design the Clifton Suspension Bridge in Bristol, illustrating how he lowered a diving bell from a boat to repair a hole at the bottom of the river in 1827. 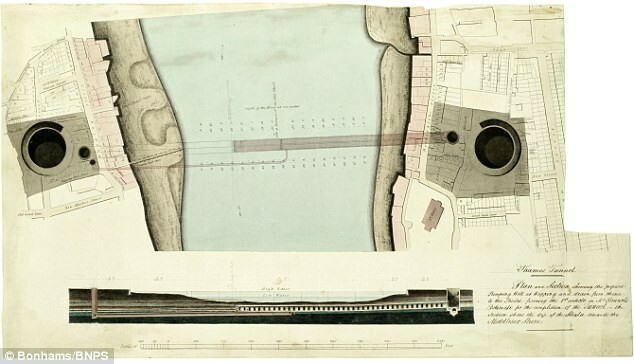 There was a cross-section of the tunnel by the project's chief mechanical draftsman Joseph Pinchback which shows it extending halfway across the river and includes the Rotherhithe shaft and nearby buildings. The overall cost of the tunnel was £634,000 - far more than budgeted - but it became a major tourist attraction, attracting two million people a year who each paid a penny to pass through. It also became the haunt of prostitutes and 'tunnel thieves' who lurked under its arches and mugged passers-by. The tunnel was designed to accommodate horse and carriages but this idea was scrapped because of a lack of access. Instead, it was used solely by pedestrians until it was purchased in September 1865 by the East London Railway Company. The first train ran through the tunnel on December 7, 1869 and it is part of the London Overground network connecting Rotherhithe and Wapping today.